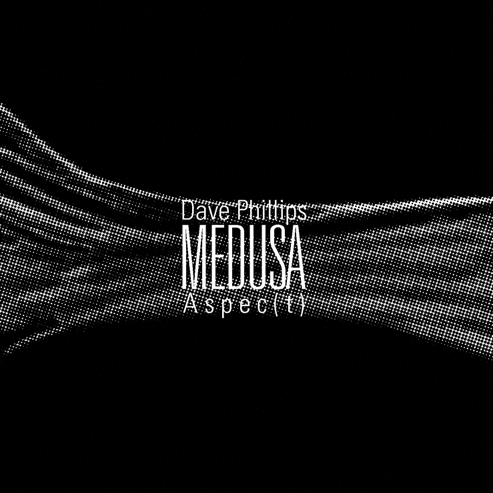 Medusa, the first collaboration between Dave Phillips (DP) and Aspec(t), (Mario Gabola and Mimmo Napolitano) is no doubt challenging music, but as the liner notes remind us, we live in challenging times. One aspect of global climate change that’s been all too often neglected is the impact human activities have had on our oceans. Medusa refers not just to the mythical Gorgon but is also Italian for jellyfish, giving the title an added weight with the evocation of the monstrous. Monbiot believes that the jellyfish is a good symbol for the threat we are currently facing, representing the “the collapse of the ecosystem and the spinelessness of the people charged with protecting it.” These three musicians clearly feel the same, and have mobilized this symbol as an artistic response worthy of the cause. In the above referenced article, Monbiot poses the question, “Why is it still acceptable to eat the endangered large predators of the sea?” and explains the seriousness of the issue. Inspired by Monbiot’s work, Medusa is a powerful expression of this dire situation in the form of tightly structured musique concrète events and freewheeling, at times raucous, harsh-noise. Over the course of 23 tracks and 50 minutes, the listener is subjected to all manner of sounds but it is clear that the utmost intention lurks just below the surface of these churning waves of chaos. Most of these chapters are just a minute or two, some as short as five seconds, setting a quick pace for our journey. Rather than a constant drone or wall of sound, the trio incorporate passages of relative silence into their compositions, a masterful use of dynamics to maximize the impact. The majority of the sounds employed are abstract and unrecognizable, the theme expressed through mood and track titles rather than representation. Don’t expect any cliched ‘submerged’ filters, dripping water or splashing waves. At times brutal, other passages feature enough repetition to suggest a groove before being interrupted by a sudden shift or a lingering drone. Much of the material feels unrestrained and improvisatory in its energies, but arranged and composed so as to impose an overarching order in the form of a dedicated narrative. Channeling the image of an ecosystem under threat, an ecosystem so vast that any threat to it is a threat to us all, much of Medusa is understandably as angry and terrifying as its mythic namesake. Waves of feedback recede into mechanical noise, field-recordings come and go, shots are fired and screams roared, words cut up and reversed so as to be denied meaning. To me, the use of feedback is the dominant trope, and nowhere has feedback been so apt of an aesthetic symbol as on Medusa. As a result of over-fishing, the fish “have been replaced by jellyfish, which now outweigh them by three to one. The jellyfish eat the eggs and larvae of the fish, so the switch is probably irreversible.” That is, we have initiated a feedback loop in nature, so how better to represent this sonically than with a powerful wave of feedback? Active for over 25 years, the Zurich-based Phillips has been a member of Fear Of God, Ohne and Dead Peni, and in various guises employs a variety of tools utilizing voice, performance, multimedia, loops, and drum machines. His most profound engagement has been with field-recordings, in particular of the sounds of insects, frog and other animals, which make appearances in some passages here. The practice of field-recording pertains to his sonic activism and the idea of the ‘era of the ‘humanimal,’ a take on the relationship between human activities and other species (and the broader ecosystem in general) that problematizes conceptions that keep these categories overly separate. In his global travels over the last two decades he’s worked to produce an archive of field-recordings of animals and their environments. Although the hypnogogic effects of the sounds can speak for themselves, his work as an activist leads him to accompany his performances with this pamphlet expounding on the the importance of the insect world for human existence. A collaboration with Naples’ Aspec(t) seems perfectly natural, and the resulting album quite cohesively blends Phillips aesthetic into the singular soundworld of the duo. Comprised of Mario Gabola (also of A spirale), who contributes sax, feedback and electronics, and Mimmo Napolitano (aka SEC_), who manipulates a reel-to-reel tape player and feedback from a no-input mixer, Aspec(t) represents a highpoint in the convergence of electroacoustics, noise and free improv. Both members of the duo have created mixes for the LCNL series, granting a window into their inspirations, aesthetic, and processes. Past albums, such as Abbatoir released on the French Nunn Records, showcase this style well. A joint release by Noise-Below.org and Excrete Music #3, I shouldn’t neglect to say a word about the truly exceptional packaging. Any who picked up SEC_’s masterpiece Outflow won’t be surprised by the attention to detail given to the packaging, but images, design, and paper choices really do come together beautifully, serving as a fitting house for an album as showing as much dedication as Medusa. I’d like to include this short excerpt from “NEW ITALIAN EPIC: WE’RE GOING TO HAVE TO BE THE PARENTS,” a lecture given by Wu Ming 1, one writers that make up the Italian ‘band of novelists’ Wu Ming. Part of this talk deals explicitly with the threat to our oceans, and gives further important context to this issue. We all come from the sea. We came out of the sea a long time ago, evolved on dry land and became what we are, human beings. We come from the sea, but the sea is dying. The sea suffers from “hypoxia”, a shortage of dissolved oxygen. Salt water becomes “anoxic”, without oxygen, and fish die, all aquatic life dies. The areas where this happens are called “dead zones”. Last summer, researchers counted 146 of them, and some are huge, for example the dead zone in the Gulf of Mexico is about 300 miles wide and stretches across 8,000 square miles — which is the surface of Wales. Try to imagine it: an area as big as Wales with no oxygen at all and no form of life. And it isn’t even the largest “dead zone” in the world: the sea floor of the entire Black Sea has become a “dead zone”, with extremely low oxygen concentration and no fish, no plancton, no seaweed, nothing alive, nothing, and we’re talking about an area of nearly 170,000 square miles. What are the causes? It’s a chain reaction triggered by the nitrogen fertilizers we use in agriculture. These substances end up in rivers, and rivers carry them into the sea, and the sea dies little by little. “Dead zones” are just one of the many causes of the extinction of salt-water fish. There’s also overfishing, there are other kinds of pollution, and there are the consequences of climate change. Some scientists have predicted the complete extinction – complete extinction – of saltwater fish by 2050 if no-one intervenes to slow down or reverse the current trends. A little more than forty years from now, no more fish. Waters empty of life and full of death. And if the sea dies, the dry land will follow soon. If the sea ceases to be an ecosystem, no other place will be an ecosystem anymore.